Given the location of Strategic Energy Resources’ (ASX:SER) Myall Creek Copper Project, chairman Stuart Rechner is understandably excited by recent news from mining powerhouse BHP (ASX:BHP) — the discovery of a potential new iron oxide, copper, gold (IOCG) mineralised system, located 65 kilometres to the south-east of BHP’s operations at Olympic Dam in South Australia. From just four diamond drill holes totalling 5346 metres, BHP intersected copper, gold, uranium and silver mineralisation of IOCG style on its exploration licence 5941. Laboratory assay results showed downhole mineralisation intercepts ranging from 0.5% to 6% copper with associated gold, uranium and silver metals. BHP is evaluating and interpreting the results reported and planning a further drilling program, which will kick off early next year. The results released by BHP are shown in the table below. BHP's news is likely to cause a flurry of activity in the region. Strategic Energy informed the market in late September that the Department of Defence had granted it access to operate within the Cultana Training Area in order to explore the Myall Creek Project in South Australia. Importantly, Strategic Energy has established a solid relationship with the Department of Defence over many years — it is a credit to management that SER is one of the only groups to have been previously granted access to explore within the training area. 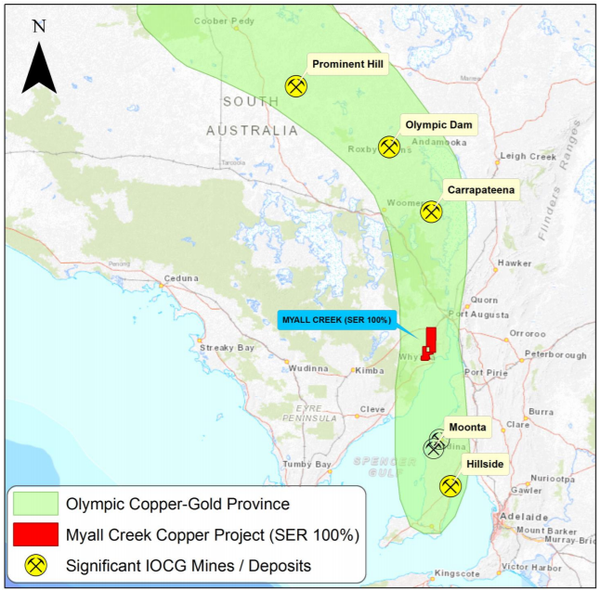 As evidenced from the map below, the Myall Creek Copper Project is situated in a central position of the Olympic Copper-Gold Province. 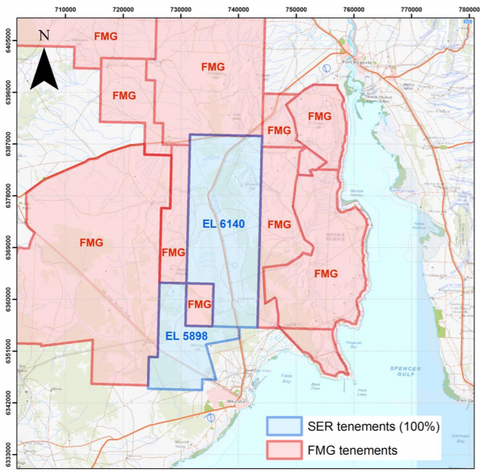 Providing further interest is the fact that the company’s tenements are surrounded by ground pegged out by Fortescue Metals Group (ASX:FMG) as recently as this year, providing it with a substantial position as it seeks out the next Olympic Dam. SER's tenements are surrounded by Fortescue's land holding. From Strategic Energy’s perspective, the company is in a prime position to target both IOCG mineralisation in the Proterozoic basement and sediment-hosted mineralisation in the overlying sediments. Key IOCG host rocks are present within the project area and overlying sediments include a 15 kilometre zone with anomalous copper in historic drilling. Now that access has been granted, management is planning a detailed ground gravity survey within EL5898 to refine previously untested drill targets generated by former holder St Barbara. Consequently, SER is very much a ‘watch this space’ story with the potential for its share price to gain momentum from important news flow. The area around Myall Creek has recently come under the microscope, as it has been the focus of a substantial body of work by the Geological Survey of South Australia (GSSA). In August, the GSSA published a report — Roopena Basin: Sedimentary basin formation associated with Mesoproterozoic mineralising event in the Gawler Craton. It notes that both Olympic Dam and Prominent Hill are spatially associated with sedimentary rocks deposited synchronous with volcanism, which suggests an active sedimentary basin may be significant in the formation of IOCG mineralisation. This further demonstrates the extent of the IOCG system as Prominent Hill lies to the north of Olympic Dam, while the $2.7 billion Oz Minerals’ (ASX:OZL) Carrapateena copper-gold project is much closer to Myall Creek, as it is situated south of Olympic Dam. This adds weight to the proximal location of Myall Creek as Carrapateena is a 4.2 million tonnes per annum project with an estimated mine life of 20 years. Annual production from Carrapateena is expected to average 65,000 tonnes of copper and 67,000 ounces of gold. The Myall Creek district includes one of the best preserved sedimentary successions of the type referred to in the GSSA report. Management believes this further increases the likelihood of IOCG mineralisation being present under cover at Myall Creek. Strategic Energy is an interesting story from a number of perspectives — it has multiple projects that provide diversified mineral exposure, as well as a unique agreement with the $300 million Clean TeQ Holdings (ASX:CLQ) to commercialise a graphene-based water treatment technology. 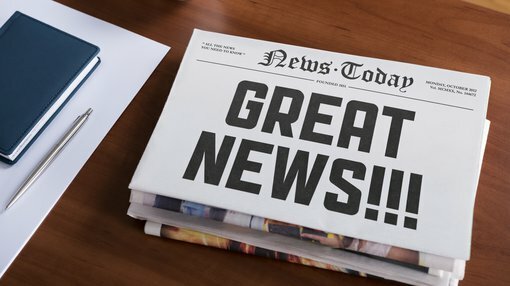 The latter relates to the company’s 15% stake in Ionic Industries, and the formation of the Clean TeQ joint venture (JV) is a significant milestone, demonstrating that Ionic’s graphene technology is attracting the attention of major industry players. The JV, owned 75% by Clean TeQ and 25% by Ionic, will focus on achieving commercial-scale production of GO-Membranes, as well as water purification modules targeted at wholesale and retail customers. Ionic's graphene technology is attracting major attention. Ionic will grant the JV a sub-licence for Graphene Oxide (GO) technologies in the field of water purification. Importantly, the JV has a head start in progressing the project, having entered into a partnership in 2017. This required Clean TeQ to fund a $200,000 program to develop, manufacture and apply GO-Membranes to water filtration applications. Following 18 months of testing, a process was successfully developed to manufacture high-purity GO that can be applied to membrane support to create a highly efficient graphene nanofiltration membrane. The GO-Membrane manufacturing process has now been demonstrated on commercial-scale industrial equipment, indicating that GO-Membranes have the potential to deliver significant benefits due to their high water flux, tunability and non-fouling properties. 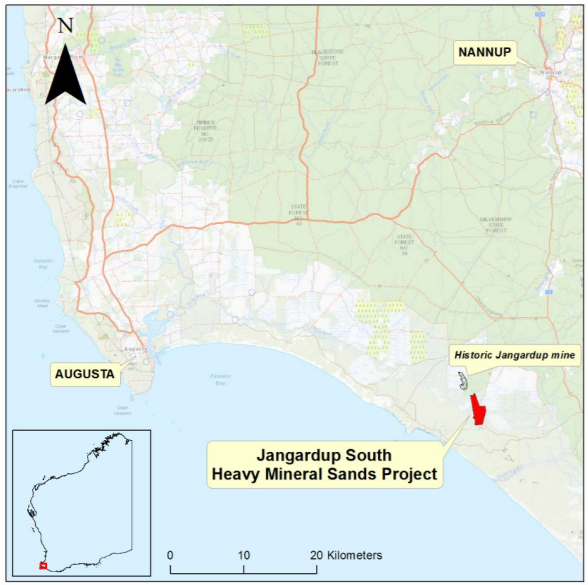 In August, Strategic Energy lodged mining lease application M70/1385 over the Jangardup South heavy mineral sands deposit in the south-west corner of Western Australia. The application was the result of over a year of research and preparation by the company. The 500 hectares area lies four kilometres south of the historic Jangardup deposit which was mined from 1994-2003 by Cable Sands. As with Myall Creek, this is excellent real estate — it is home to a well-established mineral sands mining industry with multiple operating mines, world-class expertise and existing infrastructure. Given the highly prospective nature of its projects, it is hard to believe that Strategic Energy has a market cap of less than $4 million — particularly given that the group has cash of $1.5 million. Adding further to the seemingly substantial divide between the value of the group’s assets and its enterprise value is the fact that it also owns the Saxby Gold Project in a prolific high-grade region of Queensland. Such is the tenor of the area under exploration that several major mining companies have recently joined the hunt for high-grade gold near Saxby. Newcrest (ASX:NCM) and Rio Tinto (ASX:RIO) have made applications for mineral exploration permits just to the south and Mount Isa Mines already holds granted exploration permits in the area. Two historic drill holes at Saxby spaced 200 metres apart returned hits of 17 metres at 6.75 grams per tonne gold and 15 metres at 9.09 grams per tonne gold. SER management has developed a drilling program for Saxby and is considering JV options to fund the program. With several big players looking to acquire tenements in the area, the emergence of a JV partner may not be far away, and such a development could see the value of the asset reflected in the company’s share price. On this note, management recently confirmed that it is discussions with multiple potential partners.